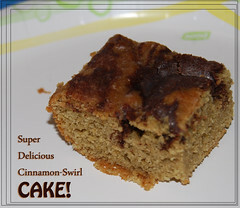 Experimental Katie: Super Delicious Cinnamon Swirl Cake-Gluten Free! Super Delicious Cinnamon Swirl Cake-Gluten Free! I made this on Sunday, and it was a big hit! It's pretty easy, too, which just makes it that much better. Cream together first four ingredients. Then add the rest of the ingredients and mix until smooth. Pour into a greased 9 x 13 pan. Mix together the dry ingredients. Then add in drops of milk just until it all binds together. Add spoonfuls into the cake batter and swirl around with a knife. Mix together the cinnamon and sugar. Then add the vanilla and a tablespoon or two of milk. Keep slowly adding milk until the mixture just starts dripping off of your spoon. Brush onto the cake as soon as it comes out of the oven.